From what I know this picture was taken in Washington D.C. It’s widely available in print but I don’t know who the photographer was. 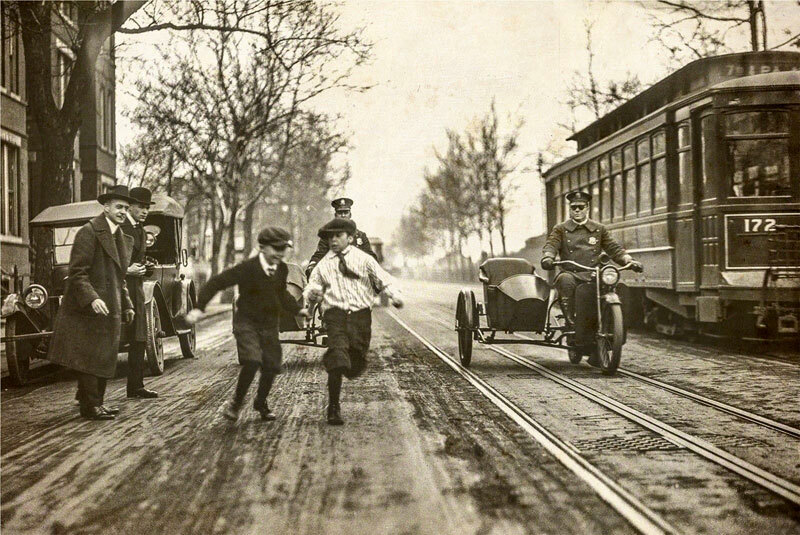 A great, great picture however, of two boys running ahead of two cops on motorcycles and side cars. Most likely taken in the late 10s, it gives a furtive taste of how free kids were to roam the streets, something I’m happy to say I am old enough to have experienced myself, free of smart phones, free to run wild until you got home and mom gave you a scolding for staying out so late. This entry was posted on Tuesday, June 9th, 2015 at 10:54 pm	and tagged with 1910s, streetcar and posted in Boys, Groups, Others. You can follow any responses to this entry through the RSS 2.0 feed. It is a carefree picture, everyone seems to be smiling.